The day has finally come!!! The N Sale is open to everyone! There are so many amazing deals that it can be overwhelming. I totally got overwhelmed last year and purchased a couple of things that I didn't wear much. So this year, I made sure to only purchase items that I KNOW I will get a ton of use out of. In today's post, I'm sharing closet essentials that you can get for a steal and totally get your money's worth out of! I've broken it down into categories- leggings, jeans, pullovers, shoes, basic tees, sweaters, and gift ideas. Also, items sell out SO fast. If you see something you absolutely love, put it in your cart and check out to make sure you get it and then continue shopping... this is not wasteful thanks to free shipping and free returns at Nordstrom! Happy shopping!!! Live In Lite Crop Leggings (now- $33.90, regular- $52) After loving the Zella leggings I purchased last year so much, I ordered these this year! And I also got Zella maternity leggings, but they are currently sold out. These cropped leggings actually came in the mail last night, and I am OBSESSED. They are so soft and all I want to wear! Zella leggings never go on sale, so grab them now to get the BEST leggings ever for a serious deal! AG jeans are my favorite designer jeans and NEVER go on sale. I'm not getting a pair this year because I would need to order maternity, but if you are looking for a very nice pair of designer denim at a steal, you cannot go wrong with either AG pair I linked below. They are both so flattering and comfortable. I have also linked a pair of J Brand, as well as a more affordable brand! Wubby Fleece Pullover (now- $51.90, regular- $78)- If they have this in your size, order it NOW! It is the softest and comfiest piece of clothing I have ever owned! This was the first thing I ordered at 2 AM when early access went live! Nordstrom suggests sizing down 1 size, but I actually sized up one size to a large because I like pullovers to be plenty roomy. And the large gave it a little extra length, so that I can wear it with leggings (which will be my uniform for life)! Mine is the color charcoal. One more perk- pockets! Make + Model Hoodie (now- $31.90, regular- $49)- I ordered this in green lilly yesterday! It looks like something I would wear with leggings and live in. Uniform #2! BP Open Toe Mules (now- $49.90, regular- $79.95)- Such cute mules and a great price too! Hunter Original Tall Rain Boots (now- $99.90, regular- $150)- Under $100 for Hunter boots= winning! Free People January Tee (now- $31.90, regular- $48)- Free People for under $32- yes please! The length is perfect to wear with leggings, and the material is so soft! I got my regular size medium because although there is a lot of fabric, the sleeves are more fitted. BP V-Neck Short Sleeve Tee (now- $11.90, regular- $17)- Now is the time to stock up on basic tees. This is such a great basic to have in your closet, especially for the price! I got the black one in my mailbox yesterday! I'll attach a mirror selfie here as soon as I can! BP Scoop Neck Long Sleeve Tee (now- $18.90, regular- $29)- I ordered this tee in white, black, and olive last year. 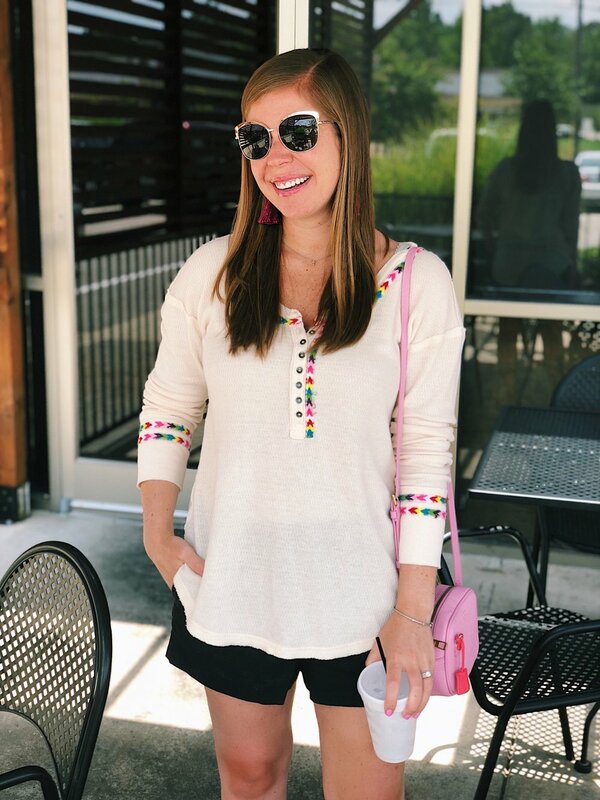 They are the softest tees and such a good closet staple! I sized up to a large for extra length. Free People Rainbow Thermal (sale- $44.90, regular- $68)- I got mine last year and love it! It is the cutest thermal to wear as we transition to fall and into fall with jeans and boots. I usually wear medium in Free People, but I sized up to a large in this one to give it a little extra length. Bliss Plush Throw (now- $25.90, regular- $39.50)- I can never say enough good things about this blanket. I have gotten it monogrammed and given it as baby gifts and Christmas gifts, and basically every person in my family has at least 1. We need more than 1 in our household because Parker, Bailey, Rosie, and I are always fighting over ours. You just can't beat the price for the quality. I highly suggest stocking up your gift closet with this soft throw! Votivo Candle (sale- $21.90, regular- $28)- Such a good gift to have on hand! Bobbi Brown Deluxe Eye and Cheek Set (sale- $98, regular- $380)- The value of this set for the price is insane! And it comes with a free gift too! To check out more of my picks, go to the menu at the top of the screen, and check out the N Sale page. There are so many other amazing deals, but the things I shared in today's post are the best! Let me know if you have any questions about sizing or anything! Thanks so much for reading! Have a great day!